Hyundai says the new Sonata has more passenger volume than the Fusion -- 103.8 cubic feet vs. 100.3. The redesigned, fourth-generation Hyundai Sonata is a dramatic departure for the brand. The 2011 Sonata's conservative styling has been replaced with a sleek, fluid look that derives elements from the upscale Hyundai Genesis sedan. The sedan's base sticker price is expected to be less than $20,000. The redesigned Sonata is nearly the same size as the 2010 Ford Fusion. The Sonata's width is identical to the Fusion's, 72.2 inches, and the Sonata's length is 0.9 inches shorter. Hyundai says the new Sonata has more passenger volume than the Fusion -- 103.8 cubic feet vs. 100.3. The Toyota Camry has 101.4 cubic feet. The Sonata's competitive set also includes the Honda Accord, Nissan Altima and Chevrolet Malibu. 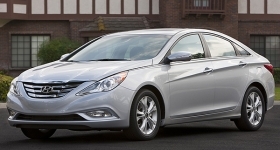 Hyundai said the Sonata will be classified as a large car by the EPA. Production begins this month in Alabama, and sales begin in January. The 2011 Sonata will be powered by Hyundai's new 2.4-liter, direct-injection engine, mated to a six-speed manual transmission. A six-speed automatic is optional. Horsepower ranges from 190 to 200, depending on trim. A six-cylinder engine will not be offered. A turbocharged, 2.0-liter four-cylinder will be introduced in late 2010. Horsepower was not announced.